I love detective stories. Not modern detectives (too much blood and guts for me), but old-fashioned, tough talking detectives, those stylishly dressed men who trade quips with clever dames. I make no apologies for my literary crush on Archie Goodwin. So, with a long list of literary detectives on the children’s shelf, which is the best option to start kids on a lifetime of appreciation for snappy comebacks in the midst of nifty crime solving? My best candidate: that classic crime-solver, Nate the Great. If you haven’t reread Nate the Great since you grew up and encountered his adult counterparts, you might be surprised to see all the ways Nate is the perfect training ground for future gumshoe fans. His kooky sidekicks. In the first book of the Nate the Great series, we meet two girls who will stick with Nate through many of his later books. His first client is Annie, an African-American little girl with a giant dog named Fang. Nate explains that Annie “smiles a lot,” adding “I would like Annie if I liked girls.” We also meet Annie’s friend, Rosamond. I would venture to guess that Rosamond was the first Goth girl most of us met through literature. Seriously. She has long black hair, green eyes, and she’s “covered with cat hair.” She also has four black cats: Big Hex, Little Hex, Plain Hex, and Super Hex. Perhaps my favorite out of all the charming illustrations in Nate the Great is the picture of Rosamond’s room and her many, many pictures of black cats, each done in a different pop-art style. These friends not only fit into the mold of a classic detective story, they manage to be diverse and interesting in a way that’s refreshingly casual. All too often characters in children’s books are saddled with a set of friends who seem self-consciously unique, as if the author felt the need to announce, “Look at these DIVERSE and UNIQUE characters! !” Nate’s girls are different in a way that seems organic to the story. Child: Someone stole my _____________ (boots, pencil, spelling folder)! Me: Really? Are you sure someone actually stole it? Child: Well, it’s not here, is it? Me: So you mean your ______________ is missing, right? Child: That’s what I said! Someone stole it! There is no point in trying to argue the logic of what a dastardly thief would do with someone else’s spelling folder … the crime is clearly defined. Those kinds of mysteries of inconvenience are exactly what Nate takes on. He may be a little personally disappointed by the size of those crimes – in the first story he is hoping for a call to look for “lost diamonds or pearls or a million dollars” – but he’s nevertheless willing to investigate them. The solutions are always satisfying, too, typically requiring the characters to look more closely at something already in plain sight. sentences, simple vocabulary, line breaks, and repetition just feel like the way any hard-boiled detective would talk. Take this dramatic moment when Nate meets Annie’s dog, Fang: “Fang was there. He was big, all right. And he had big teeth. He showed them to me. I showed him mine. He sniffed me. I sniffed him back. 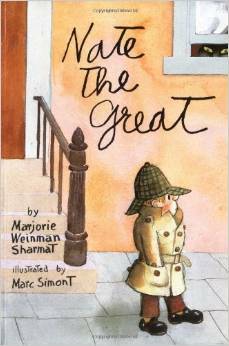 And we were friends.” The conventions of early reader children’s literature dovetail so perfectly with the conventions of detective stories that they don’t feel like restrictions as much as an artistic choice by the author. If you’re looking for a story to grab your early readers, to provide them with a genuinely engaging plot and characters, look no farther than Nate the Great. And if you’re an adult fan of the genre, do yourself a favor: put on your detective suit, make yourself a plate of pancakes, and revisit this little detective. I usually have a pretty good read (ha ha) on the types of books that my third graders will enjoy, but occasionally a book I expect to get a standing ovation gets more of a polite golf-clap when I present it to the class. When I read Detective Blue (written by Steve Metzger, illustrations by Tedd Arnold) in the bookstore, I personally fell in love. 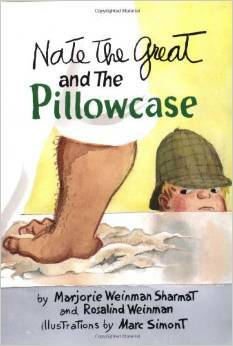 The book is a riff on noir detective stories using characters from nursery rhymes. Detective Blue (formerly known as “Little Boy”) has to interview a variety of classic characters in his effort to solve The Case of Missing Miss Muffet. Throughout the story and in the background of the illustrations the author and illustrator have tucked references to 24 nursery rhymes. Aside from a connection to one of my favorite series for adults (more on that later), I loved the graphic novel look of the book, the illustrations by Tedd Arnold (illustrator of the Fly Guy series), and the fractured fairy tale feel of the book. But when I gave the book its first read aloud last year, the reaction was a bit more lukewarm than I expected. The kids weren’t bored … but they weren’t in love either. Unlike the other fractured fairy tale books in the “Books We’ve Read” bucket, this didn’t get very many rereadings. At the time, I decided the class just wasn’t familiar enough with hard-boiled detective traditions. After all, it’s hard to see the humor in dialogue like, “Forget the plum, Horner! Just give me the facts!” when you’re too young to have encountered Sam Spade and Nero Wolfe. With this year’s rereading, however, I found hints of another, more distressing problem. I suspect … nursery rhyme illiteracy. My first hint came with the cover. 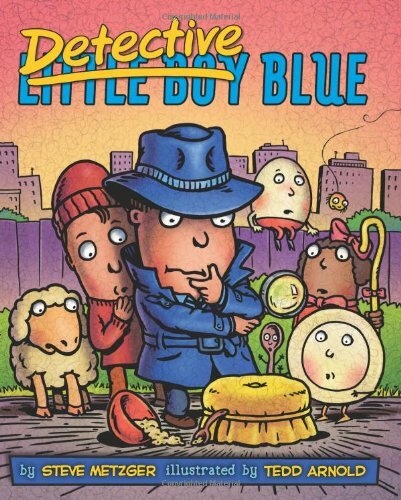 I showed the class the title, in which the word “Little Boy” has been crossed out and replaced with “Detective” (above a picture of Detective Blue in a trench coat and fedora). Me: Who has an idea about what nursery rhyme the title character might come from? Now, the kids did recognize most of the “blockbuster” characters. They knew Humpty Dumpty and Miss Muffet. They seemed vaguely familiar with Mary’s little lamb (though they didn’t seem to know the second verse … there was general confusion about why the lamb was caught sneaking into the school building), and they knew the Muffin Man (thanks, Shrek!). And I wouldn’t necessarily have expected them to identify some of the more obscure characters (like the cat walking by with a suitcase labeled “I’ve been to London”). But Old King Cole? Jack Be Nimble? Hot Cross Buns? (“Oh, like the recorder song? Why is that in this book?”) Sigh. I was frankly a little horrified by this development. 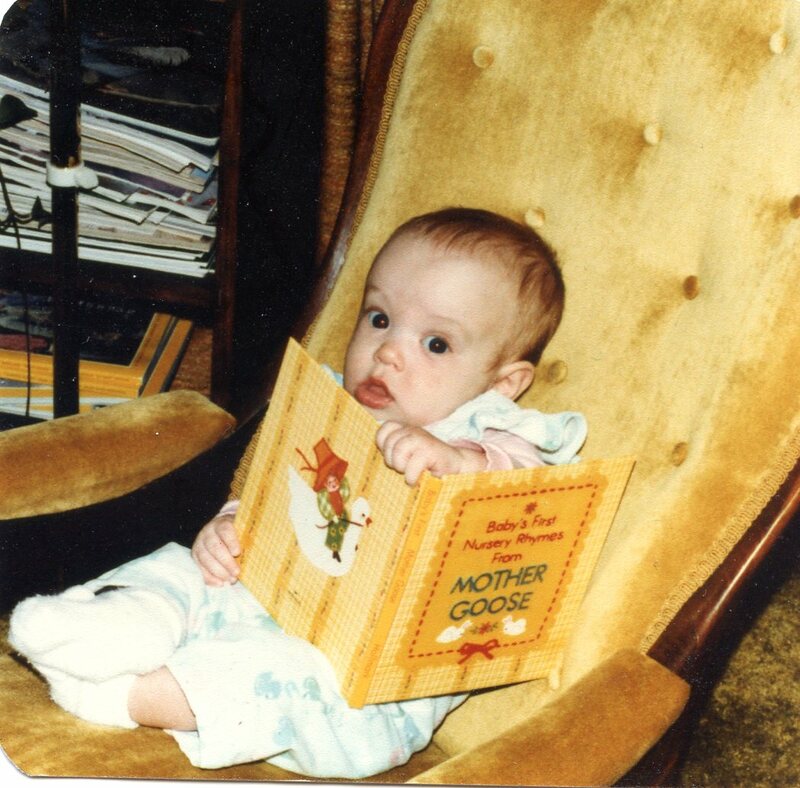 As you can see, I’ve been a nursery rhyme fan from way back, even at four months old. (Witness my death grip on my very favorite nursery rhyme book in this photo.) I don’t think the problem for my third graders is a lack of early reading … in fact, I suspect the problem might be the reverse. There are so many, many options open to parents in the board book world now that it’s easy to see how nursery rhymes could be pushed out. I could probably identify a few titles that most of my students would remember from their toddler days: Chicka Chicka Boom Boom, Guess How Much I Love You, Good Night Moon. All that early literacy pays off so well – are kids really missing anything if they miss out on the traditional nursery rhymes? Well … yes. I think they are. I think there’s something important in the shared culture of nursery rhymes, something like a childhood version of mythology. There’s the inherent pleasure of the rhymes and the language, but there’s also pleasure in the way characters become universal. Books can be parodied (like Goodnight, iPad), but only shared characters can appear in multiple versions, retellings, and reimaginings. In fact, the adult series of books that drew me to Detective Blue is based on that particular pleasure in reencountering familiar characters with a new twist. 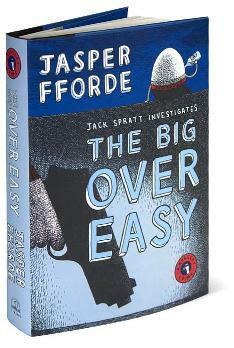 The Nursery Crime series is by the fantastically imaginative Jasper Fforde (who has one of the most vital and creative author websites I’ve seen). The first two books, The Big Over Easy and The Fourth Bear, depend on a melding of genres that draws on readers’ familiarity with fairy tales, nursery rhymes, and hard-boiled detective stories. I think we’re robbing children of something if we deny them the chance to know (and then get to know again) those characters and genres. It’s probably a little late to educate my third graders about nursery rhymes – I imagine there might be an outcry if I tried to pull out Mother Goose for read aloud – but it’s not too late for others! My recommendation? Buy nursery rhymes for your toddlers and toddlers you know. Include nursery rhymes in the board books you bring to the next baby shower you attend. 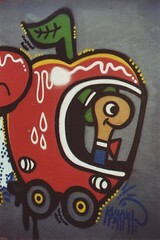 Expose kids to these characters early … and set them on the path to a whole lifetime of fractured nursery rhyme pleasure. Captivated by nursery rhymes – this could be your child! 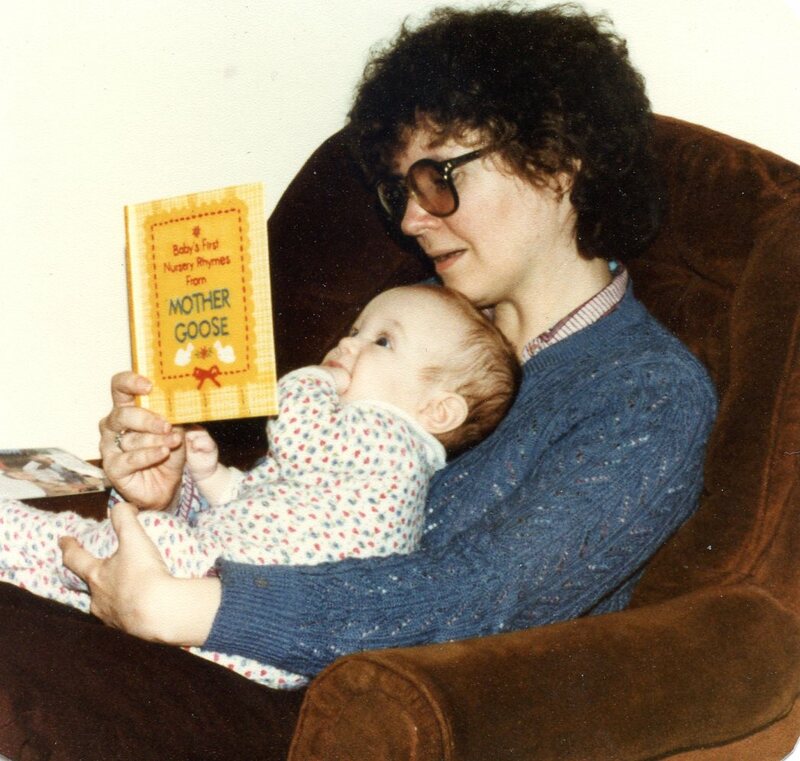 To me as a reader and a teacher, it seems obvious that a person’s childhood reading shapes their sense of self as an adult reader … in fact, that connection was one reason I started writing this blog. I believe that, if you’re lucky, you find some touchstone books in your childhood that stay with you throughout your reading life, specific stories and characters that become part of your identity. But I think that childhood reading can shape you in other ways as well. The books you read as a child can help to set your expectations for books and for genres. I imagine those streams of childhood books cutting a riverbank for each genre, training your mind in what to expect from a mystery, a fairy tale, a piece of historical fiction. A well-worn path could, I think, make it easier for an older reader to slip easily into more sophisticated examples of a genre they learned as a child. Which brings me to fantasy. Magic, wizards, fairies, and spells are all very common features of children’s books, and those elements seem to point the way toward an adulthood of quality fantasy reading. However, this fall I discovered a book that captured so many elements of classic genre fantasy that it seemed to quality as a set of training wheels for a future of Tolkien and McCaffrey. I present it here as a good starting place if you’d like to set your children on a path toward speaking Elvish (or at least appreciating it). The book is called The Dragonling, and it is part of a series of six books by Jackie French Koller. She describes the books and her process of writing them on her website. As I read The Dragonling with one of my book groups this fall, I found myself becoming more and more tickled by the ways in which it fit so neatly into expectations for the fantasy genre, on so many different levels. 1. The Practical Level. Honestly, this book just sounds like a fantasy. It’s set in a village that is both vaguely medieval and somehow timeless: thatched roofs, men dressed in tunics and knee breeches, lots of bow-and-arrow hunting. 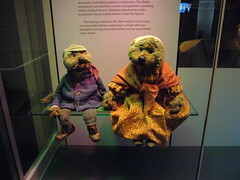 The characters have names like Darek and Clep and Pola. There are dragons, carefully classified into different species, as well as other familiar-sounding but fantastical creatures and plants, like glibbets and barliberries. There are also specific rules of this fantasy world: a dragonhunt is a rite of passage for young men; the killer of the dragon is named the “marksman” and has the honor of wearing the dragon’s claw around his neck. All of this essentially boils down to “world building” in the best tradition of great fantasy books. It’s world building that is simple enough for third graders to grasp, but it’s training them in that unique combination required of readers of fantasy: suspending disbelief while also following the strict, author-established rules of a world. 2. The Character Level. It will surprise no one who is a fan of adult fantasy that this story centers on a young man who makes a connection with a creature from outside his own world and has to make a series of Right Decisions, many of which involve going against his family and his traditions. When Darek’s brother brings back the body of Great Blue dragon from a dragonhunt, Darek discovers a baby in the mother dragon’s pouch. He names the tiny dragon Zantor and sets out on a quest to bring it back to its home in the Valley of the Dragons. Along the way he learns to question many of the things he had been taught about dragons and forms a friendship with the little dragon. This type of solitary hero’s quest may seem familiar … but that’s because it’s so effective. 3. The Thematic Level. To me, one of the key elements of a great fantasy book is its ability to speak to Big Ideas, which can often be approached more directly because the setting and characters are comfortably removed from our world. The Dragonling delivers on those Big Ideas, and manages to do so in a third-grade friendly way. When I read the book, I personally focused on some pacifist ideas: by the end of the novel, Darek and other members of his community start to take a stand against the idea that killing others is a way for boys to prove themselves as men. Interestingly, when I asked the students what they thought the lesson of the story might be, they focused instead on big social ideas. Over the course of the story, Darek learns that dragons are peaceful plant-eaters instead of the dangerous hunters he’s always been told they are. One of the students pointed out that part of the story and said she thought it was meant to teach “not to listen to what other people say about someone, but to find out for yourself what they’re like.” Pretty big ideas from a third-grade level story, but completely accessible for these readers. Perhaps one of the most fantasy-like elements of this fantasy novel was the reaction of the kids who read it. I read this with a group of five (three girls and two boys) and every one of them responded with almost obsessive love for this book. We were reading an edition that had the first three books in the series, and I had originally planned to just read the first one. When I suggested that we might not read the second (A Dragon in the Family), the group practically mutinied. They were devastated to learn that we wouldn’t be reading the third book, Dragon Quest (my perfectly reasonable argument that we were going on Christmas break and therefore wouldn’t be IN a book group falling on deaf ears) and all begged to be allowed to read the third book on their own. Honestly, if there were a Comic Con equivalent for Dragonling books, I think I would have had five potential visitors ready to go. As I get this blog up and running again, I’m going to continue to look for the books that can set young readers on track for a lifetime of good genre reading … and retrace the books that set me in those paths. If you’re in the process of growing a young fantasy reader, this series is a great place to start. I recently had the chance to see a now two and a half year old friend of mine enjoy a book that I had bought him for his second birthday. 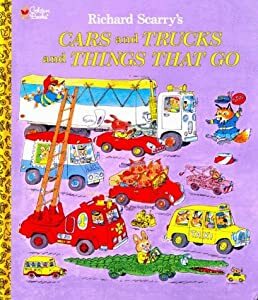 This particular birthday party was bus-themed, and this particular birthday boy is already a book lover, so it seemed necessary to include Richard Scarry’s Cars and Trucks and Things That Go among his birthday presents. Six months ago, he was able to look at the book and give it a few appreciative words, but at that point it was a bit of a hard sell. The book is huge, both in its dimensions and its length, which made it a little too long for a bedtime read aloud. The pages are paper, which seemed awfully delicate to hands that were used to board books. And the story … well, there wasn’t really a story, per se. Nevertheless, I was sure that in a few months it would become a Favored Book. And here we were, six months later, poring eagerly over the pages together on the couch. I had such utter faith in my gift all those months ago because I have such fond personal memories of Richard Scarry books in my own childhood. Not being a transportation-obsessed little boy, my taste tended more towards Best Word Book Ever and Busy, Busy Town, but I liked them all. I remember leafing through those satisfyingly big pages, totally immersed in the world on the page. (Most likely during these reading sessions I was also clutching my felt Lowly Worm doll, which I “helped” my mother sew.) That sense of immersion is my most clear memory of the books, in fact – the sense that the pages were bigger than life, and that I could fall right into them. Watching my young friend with the book, though, I had the chance to be a little more analytical about the appeal of these stories. What is it that feels so magnetic about these books for little guys? And how can someone with a board-book attention span enjoy a book that is closer to a novella in length, each page packed with details and labels and … well, busy-ness? Ultimately, I think it’s because Richard Scarry books do for little guys what nonfiction research does for third graders. They fill an information gap. They answer questions and provide facts that make the world both a bigger place and a more understandable one. For third graders, that desire for information tends to be filled by Jeopardy-like trivia. (Did you know that hummingbirds can fly backwards? If you spend any time in a third grade classroom, you soon will.) For toddlers and other little guys, the desire for information tends more toward that favorite game: What’s That? It seems most toddlers spend their days trying to slap verbal labels on everything in sight, developing their understanding of the world by developing their language for it. Ultimately that’s exactly what Richard Scarry books do: they freeze one busy moment in time and play a giant game of What’s That? with labels on almost everything on the page. Parents who might be intimidated by the length of these books (they do seem like an excellent nighttime read aloud to avoid bedtime) can be reassured that they are not stories designed to be read cover to cover. In fact, although I’m glad to see that the characters are staying part of Kid Culture with the Saturday morning cartoon based on Scarry’s work, the idea of an episodic plot seems a little beside the point. Before bed, my young friend and I chose two pages to look at closely, and then put the book away happy and satisfied. Yes, there is a general story line of a pig family going on vacation, and some engaging things to look for along the way. We had a good time hunting for the hidden Goldbug on each page and watching the intrepid policefox chasing after a dog labeled “a terrible driver.” But ultimately this is a book to be dipped into, as are almost all of Richard Scarry’s books. Perhaps the thing I’m most excited about is watching this book grow up with my little friend. It seems such a perfect fit for him at his age, but I remember reading these books when I was quite a bit older, when I had long since outgrown the need to name everything I saw and could enjoy other elements of the story. I’ll keep the book-repairing tape nearby and hope that this book survives many, many rereadings to become a lasting favorite for my friend, just as it was for me. Most of the books on my regular read aloud rotation have some specific source – maybe they were childhood favorites of my own, or books that were passed on to me by colleagues, or stories I sought out after reading a good review. Math Rashes is different … so different that I can’t even really remember where I found it (a price tag on the front suggests it may have been a remaindered book from my favorite book store, but I have no memory of buying it). I would consider this book a bit of a diamond in the rough, but one that has become a Must Read at the beginning of the school year. I usually save one particular story to read later in the year (right before our recorder concert), so this week the class and I got back to the world of W.T. Melon Elementary School for the final story in the collection. As I read, I was reminded of two things. First, every third grade classroom in the country should have this book. (Just my humble opinion.) And secondly, there’s something magical about the chemistry of a book and a group of people, whether that group is a classroom or a family, something that can only happen when you share a truly great story. 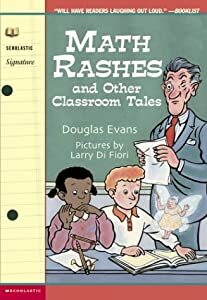 Math Rashes (written by Douglas Evans, pictures by Larry Di Fiori) is a collection of short stories about a class of third graders at the W.T. Melon School. Each story focuses on a different child in the class, and each child has a particular personality quirk or minor character flaw … nothing too serious, but all very, very familiar to anyone who has spent time with third graders. (It’s no surprise that the author has experience as a teacher and great connections for teacher on his website.) When I read this book, I often have to pause to ask, “Naming no names, does anyone know someone who acts like this character in this book?” Typically ALL the hands in the class go up. There’s Morgan, who chatters on and on endlessly and can’t figure out why her friends don’t want to spend time with her. There’s George, who never quite listens to all the directions. There’s Mimi, who can never seem to find a pencil when she needs one. In each story, some magical intervention leads to the student learning a lesson. For example, Andrew’s constant doodling means that he has to stay inside to finish the work he didn’t have time to do. At first, he’s delighted when his doodles come to life and offer to complete his work for him. But when the doodles start drawing other doodles and jumping to other students’ desks to do their work, it takes some fast work with an eraser to save the day. The format of this book is very similar to the Mrs. Piggle-Wiggle stories: child has a problem, magic intervenes, child fixes the problem. I personally loved the Mrs. Piggle-Wiggle books when I was growing up and would still recommend them today, but I think Math Rashes is a better fit for a classroom. 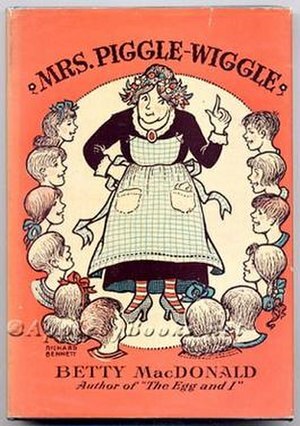 The problems Mrs. Piggle-Wiggle solved seemed a bit like parent-identified problems (not wanting to go to bed, eating slowly), and I was always a little mystified by how completely helpless the children’s parents were. I think one of the reasons my students love the stories in Math Rashes is not just that they identify with the characters, but that they identify with the friends of the characters. Most students can see why having a “chatterbox” for a friend could be annoying. A friend who doesn’t want to go to bed, or who eats dinner too slowly? Not so much. So what is it that elevates this book to the realm of Must Read? Well, it’s not so much what happens while we read the story … it’s what happens afterwards. Maybe it’s something about the familiarity of the setting or the “third-grade-ness” of the stories, but the characters and incidents in this book find a way of working themselves into our classroom culture. Children will use them as a common reference, a part of our classroom language. For example, in the story “The Pencil Loser,” Mimi is constantly missing her pencils, which she leaves all over the classroom. She discovers that a tiny pencil-shaped creature called Ti-2 (short for Ticonderoga Number 2) is delighted by her bad habit, because it gives him a chance to collect the lost pencils, grind them into shavings, and sell the shavings to the chefs of Pennsylvania to use in their recipes. Pencil losing is a persistent problem in the classroom. Reading this story doesn’t exactly cure us of our curse, but it paints it in a different light. “Look out! Ti-2 will get that!” students will squeal as they scoop a pencil off the floor, repeating his catch phrase, “What I find, I grind!” After reading about Andrew and his doodling problem, children may continue to doodle … but my reminders about erasing doodles in the margins are usually met with giggles and comments like, “Remember what happened to Andrew!” In fact, students start to use the names of the characters as if they were classmates (a practice that can get confusing when they share first names with real classmates!). The important thing is that these references are spontaneous; they come out of a real sense that these stories belong to us in a shared way. I suspect that if I drove the conversation (say, by making a poster of Ti-2 or bringing his name up in a scolding way) the power of that ownership would be lost. It’s only with a real sense of connection that the stories we read can become a shared experience, just like memories of a field trip or funny anecdotes from our year together. Dr. Michael Schiro writes about the power of those shared stories in his work on oral storytelling in the classroom, and I see it through certain read alouds as well. When a book becomes such a point of connection that the characters in it feel like members of the class … I would say that book qualifies as a Must Read. Even if it came from the remainder bin. There are some books that I save to read to my class at particular times (my stacks of holiday books come to mind) or for a particular occasion (Officer Buckle and Gloria always follows our discussion of class rules). Then there are books that I have to read because they’re just … necessary. This week I pulled A Bargain for Frances (written by Russell Hoban, pictures by Lillian Hoban) off the shelf, in part because it seemed to connect to our school anti-bullying initiative, but more because it’s just a necessary childhood book in my mind. It’s a book that could easily fall between the cracks because it doesn’t quite fit into any category. The format isn’t quite like a typical picture book, and the “I Can Read” edition I have scares away some of my more sophisticated readers. It hasn’t won any major awards (although it was a New York Times Outstanding Book of the Year in 1970). Yet every time I read it I’m struck by what a truly wise, warm, and funny story it is. In A Bargain for Frances, the young badger Frances (also featured in Bread and Jam for Frances and A Baby Sister for Frances) is going to play with her friend Thelma. Before she leaves, her mother warns her to “be careful.” She reminds Frances of other times Thelma has manipulated things so that they go her way, pointing out that “when you play with Thelma you always get the worst of it.” Frances reassures her mother and sets off for a tea party with her friend. Frances tells Thelma that she is saving up for a tea set made of real china. Yet somehow, by the end of the tea party, Thelma has convinced Frances to give her the $2.17 she has saved up in exchange for Thelma’s plastic tea set. When Frances learns that Thelma tricked her, Frances comes up with a trick of her own to get her money back. I’m still not sure if it was multiple readings of this story as a child that made it stick in my mind or if it was just the power of the story itself, but the details of this book come back to me incredibly clearly every time I reread it. I have such a strong memory of the two tea sets – the real china one with pictures all in blue and the plastic one with red flowers – that they almost seem like something I wanted myself as a child (though I wasn’t really a “tea set” girl). The single penny at the bottom of the sugar bowl that Frances uses to trick Thelma, the expressions on the two girls’ faces throughout … these little details are part of what make this simple story such a classic. Yet when I read this book as an adult, I’m struck even more by the realism of the relationship between the girls. Thelma’s careful persuasion of Frances could be studied by negotiators: she starts by talking up her own tea set, then disparages china tea sets (which are “no good” because they just break). She explains that you can’t get china tea sets any more, and tells a cautionary tale about a girl who saved up for one and never ended up getting any tea set at all. Finally, when Frances is eager to buy Thelma’s set, Thelma demurs, declaring she might have “changed her mind.” It’s masterful (and pretty funny), but also feels so right in imitating the ways little girls interact with each other. I always feel my stomach give a little lurch as I read it and watch Frances getting drawn in. This year when I asked my students how they would feel if they were Frances, one student declared, “I would feel really uncomfortable and like I wanted to get out of there!” My thoughts exactly. Frances’s trick to get around the “no backsies” promise she gave Thelma is also both clever and believable, precisely the plan a bright little girl might come up with. At the end of my read aloud of this book this week, one my students made an interesting observation. “Her mom is hardly in this story at all,” he pointed out. “She’s there at the beginning and then she doesn’t come back.” It was an interesting point, and I asked the class if they thought Frances’s mom knew about Thelma’s tricks. They all agreed that she seemed to know Frances should be careful around Thelma, but Frances didn’t actually tell her mother about the sneaky trading. “Do you think she should have told her mom?” I asked. “Oh, yes!” most of the class chorused (carefully repeating key points of our recent conversations about telling an adult if someone is bullying you). As an adult, I’m torn. On the one hand, I’d like to think my students would tell me about a situation like the one in the book. When I was a child, I tended to be quick to look for adult assistance, and I probably would have voted with the majority in my class to advise Frances to tell her mother. And yet … part of the charm of this story is the way these two girls experience this conflict and change because of it. When Thelma realizes she’s been tricked, she tells Frances she’ll have to “be careful” when she’s playing with her. Frances asks her, “Do you want to be careful or do you want to be friends?” I can’t help feeling that an adult mediator might have helped Frances to get back the tea set, but might not have helped her get to that understanding of friendships, that most powerful of lessons from this book. A recent post from the “Motherlode” blog at the New York Times echoes the importance of this lesson, calling it a Secret of Adulthood. I’m also reminded of Michael Thompson’s excellent book about children’s relationships, Best Friends, Worst Enemies, in which he writes about the importance of healthy conflict for children’s social development. Good conflict can create good relationships … and it certainly creates memorable literature. If this book was part of your childhood, it’s certainly worth rereading and sharing with the children in your life. Happy reading! Having taken my own advice about waiting until the perfect “tipping point” to introduce holiday books into the classroom, I now find myself (as I do almost every year) in a slight frenzy. You see, the size of the stack of books I was hoping to share with my class before vacation doesn’t quite match up with the number of days we have left. I suppose that’s not the worst problem in the world to have – it does flip the “countdown” feeling in my head to something positive – but I’m surprised by how important certain books feel to me, almost like I wouldn’t be ready for the holidays if I didn’t get a chance to read them. I suppose the traditions we create within classrooms can become almost as strong and personal as the traditions we create within our families, those non-negotiable ceremonies that make the holidays so special. Today I’ll focus on two books that I would consider my favorite “heartwarmers.” I’ll make time later in the week for some books that are just pure fun. similar to their other works. I find the low-key, heartwarming tone of both the book and movie to be a nice counterbalance to the more frenetic pace of some holiday specials. This book is sadly out of print, but you can find it in libraries or used book stores. It’s worth hunting down! The Jim Henson special is available on DVD, and you can find extensive informationabout the making of the film on the Muppet wiki. Silver Packages: An Appalachian Christmas Story (written by Cynthia Rylant, pictures by Chris K. Soentpiet) – Cynthia Rylant is truly a remarkable author for many reasons, not least of which is her ability to write in such completely different genres. Children who know her name from series such as Henry and Mudge or Cobble Street Cousins might be surprised to hear that she also wrote this lovely, touching picture book. 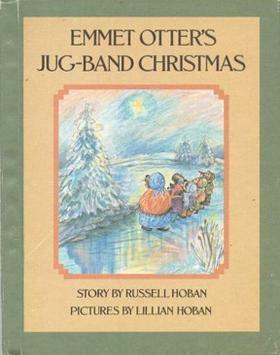 The story takes place in a poor village in Appalachia. Many years ago, a rich man had a car accident in the hills and was well-cared for by the people who found him. When he had healed, his caretakers refused to accept any money from him, and he left feeling that he owed a debt to the community. Every year he rides through the towns in the hills on a train, throwing packages wrapped in silver paper to the children who run alongside. A little boy named Frankie waits in the cold for the train, hoping every year for a toy doctor kit. One year his package has a cowboy holster and warm socks; another year it contains a toy police car and mittens. As an adult, he looks back on those precious packages and makes a decision about a debt of his own that he feels he owes. The writing in this story is poetic in a subtle way, and I absolutely love the detailed illustrations. There are some really interesting conversations to be had with children about what it means to owe someone a debt and how the gifts we give can affect others. If you’re reading this aloud, prepare yourself for the last page, though – I always have to blink back a few tears on this one. Now, a disclaimer. This book is actually my runner up for Favorite Tearjerker. My real Favorite Tearjerker is The Christmas Miracle of Jonathan Toomey (written by Susan Wojciechowski, illustrated by P.J. Lynch); however, since I can’t read that book (aloud or to myself) without actually bursting into tears, I have officially removed it from the list of read alouds so I do not scar my children emotionally. I can usually make it through Silver Packages with just a lump in my throat, so it’s a safer choice. Do yourself a favor and read The Christmas Miracle of Jonathan Toomey … but if you’re anything like me, do it in a corner by yourself with a box of tissues nearby. When it comes to the winter holiday season, that tipping point is even more ticklish. I find that it is right around this time, a week or two into December, when the tide becomes too strong to deny. Reports on last night’s Hanukkah gifts, discussions of advent calendars, and the humming …oh, the humming. “Jingle Bells.” “Here Comes Santa Claus.” It’s official: the holidays are coming. My very favorite way to (calmly) acknowledge the coming of the season is through read alouds. I’ll be kicking off my yearly Holiday Read Alouds this week in the classroom and sharing some of the ones I love in my next few blog posts. There’s always room on the read aloud schedule for a few more, so feel free to share some of your favorites through the comments section. With Hanukkah beginning this past weekend, I’ll be starting this year with one of my favorite picture books about the holiday: Hershel and the Hanukkah Goblins (written by Eric A. Kimmel, pictures by Trina Schart Hyman). Hershel is a traveler who is glad to find a friendly village for the first night of Hanukkah, but the villagers reveal that they are plagued by goblins that hate Hanukkah and stop them from celebrating. Hershel volunteers to spend each night of Hanukkah in the synagogue to see if he can outwit a series of goblins. In order to banish the goblins forever, he’ll have to arrange for the king of the goblins himself to light the Hanukkah candles on the last night of the holiday. This book is an absolutely lovely way to bring this holiday to life for children. 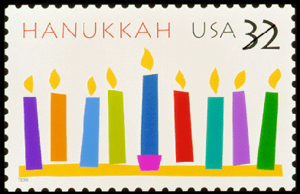 The story is genuinely exciting, and Hanukkah traditions are woven into the narrative in a way that allows children who celebrate this holiday to share their own experiences. The overall message is a positive spin on a traditional trickster tale: Hershel overcomes the goblins by using his wits and his bravery. The cast of goblins offers lots of opportunities for silly, dramatic voices. For me, perhaps the most appealing part of the book is the illustrations. I’ve always loved Trina Schart Hyman’s work – she manages to straddle the line between cartoonish personality and detailed realism, a style I find particularly effective in her folk tales and fairy tales. Here the goblins are dramatic but silly, and the king of the goblins is scary without being gory or graphic. Hershel and the Hanukkah Goblins makes a wonderful addition to any holiday library, whether you celebrate Hanukkah in your home or not. Stay tuned next week for more holiday picks, and happy reading! 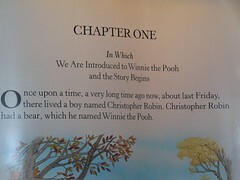 Winnie the Pooh and The House at Pooh Corner (written by A.A. Milne, illustrations by Ernest H. Shepard) fall into the category of Genuine Children’s Classics. The characters, the incidents, even some of the phrases (“Oh, bother”) have seeped into our common culture. Unfortunately, that cultural seepage means that, when I pull out Winnie the Pooh to read to my class, there are sometimes groans and mutterings about “baby books.” You see, many children have spent their childhood surrounded by the Winnie the Pooh empire – with Pooh characters popping up everywhere from cartoons to diaper decorations – without ever experiencing the stories themselves. Once children actually read the stories, they’re almost always amazed at how truly funny they are (“in a way little kids wouldn’t understand,” I usually explain). The use of language, the situations, and the tone are all much more appealing to children over the age of nine than the younger children who usually know the characters. If you have managed to sneak the original Pooh stories past an older child’s defenses and are looking for a more modern follow-up, or if you’d like a way to lead up to those classics, my recommendation is the similarly funny Toys Go Out: Being the Adventures of a Knowledgeable Stingray, a Toughy Little Buffalo, and Someone Called Plastic (written by Emily Jenkins, pictures by Paul O. Zelinsky). Its self-contained but interconnected stories (with titles like “The Terrifying Bigness of the Washing Machine” and “The Serious Problem of Plastic-ness”) and sweet illustrations make it a perfect read-aloud, either for a class or a family at bedtime. There are a few parallels between the two books that make me wonder if Jenkins was specifically thinking of the Pooh stories. In one story Lumphy the buffalo loses “something important” from his body in a way that would be familiar to Eeyore. In another chapter, the characters search for a perfect birthday present, much like Pooh’s gift to Eeyore of a Useful Pot to Put Things In (and Piglet’s thoughtful Thing to Put in a Useful Pot). There are some very Milne-like “hums” throughout the story that brought to mind both the Pooh stories and Milne’s poetry. Both authors also share a love of language (see for example StingRay’s explanation of the term for whispering suggestions in someone’s ear: “Oooooh! Submarine messages! … Why didn’t I think of them before?”). More than those specific parallels, I was struck in these stories by a similar affection for the characters. Both of these books are about the secret lives of toys, but they’re also about people children know or will come to know. Almost everyone has an Eeyore or an Owl in their lives, and we can all hope for affection from a friend like Piglet. In much the same way, the characters in Toys Go Out are vulnerable and appealing in a way that makes them instantly connectable for children. StingRay’s need to know everything (and willingness to make up facts when she doesn’t), Lumphy’s tough gruffness, and Plastic’s general bounciness are all characteristics that children can usually recognize in others … or in themselves. If you’re looking for books to start (or hopefully continue) a family read-aloud routine, I can’t make a better recommendation than these two. They’re cozy, connectable, and very, very funny. And if you’re an adult fan of Winnie the Pooh, I also recommend you acquaint yourself with this new generation of literary friends. Happy reading! – There are a multitude of official and unofficial sites about Pooh Bear, but the site of Peter Dennis, connected to his audio books of Milne’s work, is particularly informative and well-constructed. 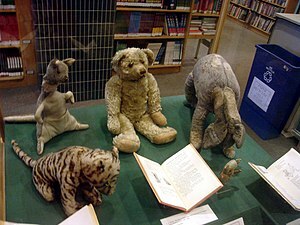 – Amazon.com’s biographical page about A.A. Milne also gives some background about the man and his work. I admit it: I just love it when I visit a website like Amazon or Netflix and up pops a window with special recommendations, “just for you.” I know I should probably be a little creeped out or offended that they’re keeping tabs on me, but honestly, I’m just tickled by it. I won’t say their algorithms are always accurate (I usually get a flood of particularly random “recommendations” right after buying gifts during the holidays), but occasionally I’ll discover something new and genuinely interesting. Perhaps even more fascinating than the recommendations themselves is the science that goes into them. What exactly is it about my interest in Agatha Christie’s “Poirot” that makes me more likely to enjoy “Upstairs, Downstairs”? Mind you, marketers try this kind of thing all the time with children’s books, but often with varying degrees of accuracy. After the blockbuster success of A Series of Unfortunate Events there was a sudden flood of novels with dark, depressing stories about orphans with an Edward Gorey style cover. In order for that kind of marketing to work, however, the connections between the old and new have to be more than skin-deep. We can help children to make some of these connections themselves by starting to recognize ideas about genre, or pick up on elements of an author’s style that pulls them back again and again to that author. Still, it never hurts to have a few “connected texts” in our back pockets as adults, ready to offer to wandering readers when needed. As an adult, one of the great pleasures of continuing to explore new children’s books is finding ways that new texts connect back to a story from my childhood, or ways that a fan of a more recent novel can be led back through it to an older book. Over the next few posts, I’ll be offering up some of my own “If you like … then you’ll love …” pairings. Coming up next week will be a true old favorite and a book I consider a new classic: I believe that fans of Winnie the Pooh by A.A. Milne will just love Toys Go Out by Emily Jenkins. While you’re waiting to hear my pitch for this great combination, feel free to share your own “If you like … then you’ll love …” pairs in the comments section. Happy reading!